SB 50, California’s most far reaching housing production bill ever, has its first hearing today in Sacramento. Led by chief sponsors Bay Area Senators Nancy Skinner and Scott Wiener, SB 50 is backed by the California Labor Federation, AARP California, nonprofit housing groups, big city mayors and leading environmental organizations. SB 50 is landmark legislation because it finally stops cities from using exclusionary single family home zoning to bar renters and people of color from neighborhoods. That’s why Beverly Hills, Cupertino, Palo Alto and other cities politically dominated by wealthy white homeowners– who profit from maintaining racial and class barriers— are fiercely battling SB 50. Although SB 50 prevents cities from restricting new rental and virtually all affordable housing from most of their buildable land, some progressives oppose it. Some cite “local control,” as if its “progressive” to allow neighborhoods to promote race and class discrimination. Some do not want to be on the same side of a housing fight with Scott Wiener, ignoring that co-sponsor Nancy Skinner has a forty year history of backing tenants. 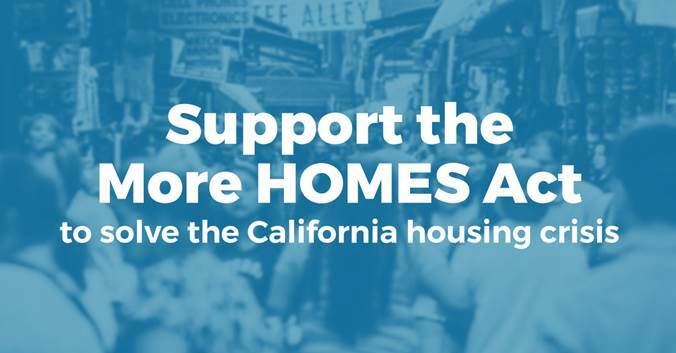 The LA Tenants Union and the AIDS Healthcare Foundation—both of whom lined up against a majority of progressive LA groups in backing the anti-development Prop S in 2017—claim SB 50 only promotes “luxury” housing, ignoring the affordability requirements in the bill. Some San Francisco supervisors oppose SB 50 because they are beholden to luxury homeowners in their districts, and these owners profit from preventing apartments in their neighborhoods (luxury homes are defined as those selling for at least $1 million, which is most of the city’s single family stock). It’s obvious why wealthy white homeowners are leading the charge against a bill that opens their neighborhoods to renters. But why would any progressive fight to preserve a status quo that allows mansions to be built throughout California cities but not apartments? Last week I did a panel on development without displacement at the National Low Income Housing Coalition (NLIHC) Policy Forum. I was joined by Austin Councilmember Gregorio Casar. Casar’s “Affordability Unlocked” proposal increases height, density, and floor space for developments where at least 50% of the homes are set aside for low income families. This will expand Austin’s affordable housing supply by 25%, 100%, or even 500% in some neighborhoods. SB 50 similarly ties increased development to expanded affordability. It includes protections for rent-controlled housing greater than most California cities currently have. There are many ways to ensure that development does not cause displacement. But insisting on 100% affordable housing as the only structures that should be built is the wrong approach. It is part of the anti-development strategy that has caused rents and home prices to rise and generated the gentrification and displacement that has swept across California. In Generation Priced Out: Who Gets to Live in the New Urban America, I show how urban gentrification in San Francisco, Los Angeles, Berkeley, Oakland, and other California cities has been primarily driven by no-growth policies and restrictive zoning, not new development. San Francisco’s late 1970’s wave of gentrification and displacement was fueled by increased population and job growth, and the city’s failure to protect tenants and build anywhere near enough new housing to meet rising demand. Mayor Feinstein contributed to this upscale transformation by promoting rent control loopholes, twice vetoing rent control on vacant apartments, and killing much of the small scale building industry by downzoning the Westside to stop new housing. The Haight-Ashbury, Noe Valley, Bernal Heights, Alamo Square and many other San Francisco neighborhoods all saw housing prices skyrocket despite little if any nearby market rate housing getting built. Yet it remains an article of faith among some progressives that excessive housing development caused the city’s gentrification. That’s why San Francisco progressives who claim that SB 50 threatens gentrification avoid identifying which neighborhoods they are talking about. Most Supervisors represent long gentrified districts that are primarily filled with luxury homes. The neighborhoods not completely gentrified—-the Tenderloin, SOMA, Mission, Bayview and Chinatown—-currently allow new apartments and would be little if any impacted by SB 50 (yes, the city’s most affordable neighborhoods are those never bound by single family home zoning). SB 50 has laid bare the longstanding and elitist progressive-luxury homeowner alliance. This alliance still keeps most of San Francisco—and nearly the entire Westside— open to new mansions while barring new apartments. I don’t see anything progressive about promoting pro-mansion, anti-apartment zoning. The Board of Supervisors has had decades to stop these pro-mansion, anti-rental housing policies in much of San Francisco, yet has failed to act. Progressives’ alliance with luxury home owners has priced out the working and middle-class from much of San Francisco. It has also worsened inclusion and racial diversity. Progressives certainly cannot publicly admit they are perpetuating elitist and anti-renter zoning, so they want the public to believe they are instead protecting unnamed “at risk” neighborhoods from gentrification. Los Angeles tells a similar story. In Generation Priced Out I write about the gentrification of Highland Park, which was driven by upscale home buyers priced out of nearby neighborhoods. The tenant battles I write about in Boyle Heights involved speculators seeking higher rents from non-rent controlled housing; new luxury development is not driving the neighborhood’s potential gentrification. The Los Angeles neighborhoods most opposed to SB 50—Westwood, Bel Air, Brentwood, and the Hillside neighborhoods—all were gentrified by the 1970’s. These homeowners use anti-development rhetoric to stop new apartments in their neighborhoods. While some argue that Los Angeles upscale downtown development impacted Highland Park and other neighborhoods, those seeking a condo on the 25th floor of a downtown highrise are unlikely to instead buy an older single family home in a totally different community. Los Angeles has added one million people since 1970. Its upscale transformation is primarily attributable not to development pressures but to weak tenant and rental housing protection laws and the failure to build anywhere near enough housing to meet population and job growth. Progressive opponents of development have invented a world where new housing is either “luxury” or “affordable.” This leaves out the middle-class, the primary beneficiaries of SB 50. California cities currently use zoning laws to bar builders from constructing either “missing middle” housing or the other smaller and more affordable housing that teachers, nurses and others priced out of blue cities desperately needs. Progressives offer no strategy for housing the working or middle-class who earn too much to qualify for “affordable” housing. Nor do they have a vision for building the housing necessary to meet population and job growth. Labor unions, senior groups and nonprofit housing groups like the Non-Profit Housing Association of Northern California (NPH) understand this, which is why all back SB 50. Groups like AIDS Healthcare are so wedded to an anti-development politics that they have ended up defending a status quo that prices out working and middle-class residents from Los Angeles and other blue cities. You cannot claim to be an environmentalist while opposing infill housing. While some “progressives” in San Francisco and other cities claim to support a Green New Deal, their opposition to infill housing via measures like SB 50 undermines their credibility. The San Francisco Supervisors and Berkeley Councilmembers opposed to building apartments citywide are a key reason why 120,000 drivers commute from Sacramento to the Bay Area each day. Opposition to infill housing is a driving force behind greenhouse gas emissions and the worsening of climate change. That’s why SB 50 is the most important legislation in the nation this year. If California can lead the way on infill housing, other states will follow. SB 50 is more than a bill to increase housing; it is a blueprint for the future of urban America.